Our Computer Illustration class kicked off to an amazing start this year! Here’s a sample of the awesome stuff that has been going on. For one of the projects during the spring and summer sessions, our teenaged students used popular graphics software and digital pen tablets to apply color to a black and white anime-style drawing of a girl wearing a kimono that was drawn by the instructor. 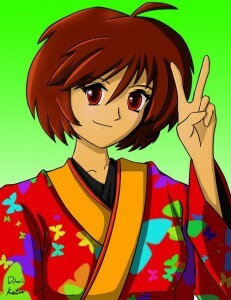 The image was “cel-shaded” to create the look of Japanese animation, and each student was free pick the colours and patterns they wanted as they learned how to work with light and shadow on a computer. Check out a few example works right here. Anyone who is interested in taking this program is invited to inquire with us. But don’t be left behind, space is limited. Make sure you sign up now and be ready for day one! For students who have already taken the first level of the Computer Illustration course and are hungry for more, there will be a brand new second level! In addition to even more comic book and anime style colouring, the course will expand to include fantasy art and digital painting. You don’t want to miss out on this exciting new addition to our digital art program.